Stock crossed my 20 percent threshold and kept going so decided to bank the profit. The company reported a much better profit level in the most recent quarter and that took the stock which had been languishing up pretty fast. I was happy to bank a 30 percent profit and so moved on. If the stock were to get back in the low $50’s again, I would definitely reconsider jumping back in. Stock fell almost 11 percent on a weak earnings report. The company is still generating strong Economic Profit. Their user level fell by a few million and that got the market upset. All the gaming stocks have been pulling back and are very much out of favour. My loss position was just over 20 percent so I was initially leaning towards selling my position as it has crossed that threshold. With the buy, I averaged my cost to $69 so I’m right now on the edge of my 20 percent cut-off, so I’ll be watching the stock closely. What kept me in was the fact that their recent release generated $500 million in sales over a weekend which is insane. Take Two’s game did even better than that with their Red Redemption property. These are unreal cash flows and given the large and growing number of people who simply watch people play video games tells me this is a very burgeoning space, including the e-sports concept. This is what I was thinking but then reality and math smashed through all this…. UPDATE: As the month wore one the stock kept tracking down and soon my loss position was at 25% which meant the stock would have to go up over 30 percent just to break-even. Given the negative sentiment I didn’t see that happening. I had the stock on a tight leash and so with the latest pullback I said that’s enough. As hard as it is to sell, I have to stay true to my investing playbook and when any stock crosses my loss threshold I have to sell regardless of how I feel about it. It feels painful right now but it is short-term pain for long-term preservation of my savings. Sure enough the stock kept dropping and feel down into the mid-$40’s. 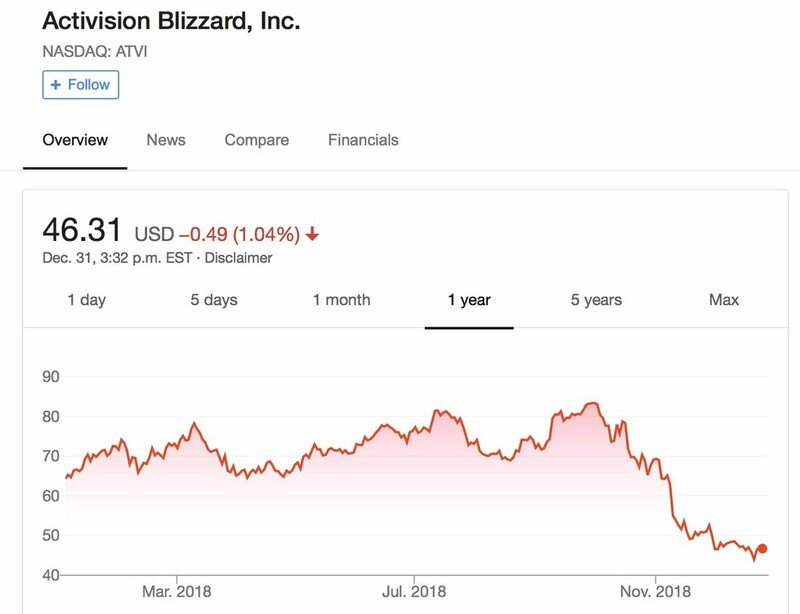 I still like the company and the whole video game/e-sports space, so I’m still going to keep Activision on my watch list and if the stock continues to track lower then I might jump back in if the fundamentals of the business remain intact. Like Activision and other video game makers, EA shares also moved heavily down. At one point it was a $150 stock and now it was trading just under $90 so I thought it would be a good point to buy more shares to lower my cost base which is now down to $93.80 from $99.24. EA is actually a more financially strong company that Activision so it will be more resistant financially to shocks in the business. That being said the compay is hardly hurting right now. Fast forward a few more weeks and the market shrugged off the kicking of the can in the US-China trade war and continued to track down. I decided to pick up some more EA as it had fallen to near $81. Fundamentally nothing really seems to have changed with the business. In fact the latest industry figures showed that growth is quite robust with October sales up 24 percent. Right now that isn’t translating into strong stock prices as EA and other gaming companies continued to fall. I thought it would be a good time to buy some more shares and lower my cost position, which subsequently went down from $93 to about $89.75 to $83. The stock crossed 20 percent threshold so decided to sell and bank the profit. Stock has been moving of late. It’s a stock I would definitely buy back into if the price were to fall back. I’ve held it in a couple of portfolios. I think it is one of the few companies who could legitimately take on Amazon and can realistically own the OS for retail, especially in the staples/grocery space. I will be keeping it on my watch list. Sure enough with the sell-off in December, the stock fell back into the mid-$80’s and I was tempted to jump back in, but I decided to hold off for now. As markets tumbled around the world, the German stock market continued to get pummelled. It was down just over 21 percent year-to-date in December. It is among the worst performing equity markets in the world. Now that’s a crash. German is still a best of breed economy that has numerous global brands. It is the economic engine of Europe. For some of these businesses to be trading at such a huge discount is incredible and as an investor it’s hard to ignore. Part of their pull back has been Deutschebank which is facing many Lehman’esque issues. This coupled with the continued trade trash-talking has taken some of the oxygen out of the German economy as they are heavily dependent on exports. With Angela Merkel bowing out, there is also a bit of political vacuum within the country and that has also created some uncertainty. 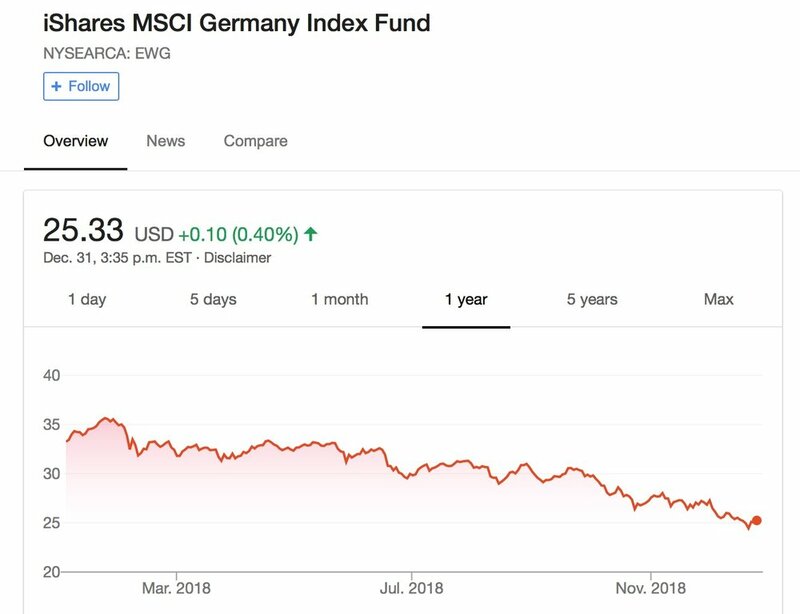 Right now German stocks are out of favour but at some point (I have no idea when), German stocks should revert back to the mean. It may take a while but I’m willing to wait. I bought some more shares to take my average cost to just under $27. The only down side right now is with the Canadian dollar weakening, it is going to cost me a tad more to buy in. A pretty hectic month indeed. Little did we know that things would get even crazier as we get into December….